The logo of the Pepsi-Cola company is one that is known in households throughout the world. Its distinctive red, white and blue colors can be found in nearly every gas station, grocery store and restaurant out there. The logo, however, has gone through many changes over the years. This article will explain where it started and how it changed over the years to become the logo that everyone knows to this day. Pepsi was originally created and marketed by Caleb Bradham in 1898. The drink, which he created in his own house, was sold under the name “Brad’s Drink.” He then, seeking a broader audience, changed the name to Pepsi-Cola. He did this to identify with two important ingredients in the drink, mainly Pepsin(a digestive enzyme) and kola nuts. As his drink became ever more popular, Caleb moved his production facility out of his house into a rented warehouse. There, in order to make a name for himself, he came up with the first Pepsi Logo which is found above. Then, in 1905 and 1906, Pepsi’s logo was redesigned to be more identifiable to the customer base. The logo created in 1906, shown above, lasted the company until 1940. Then, in 1940, the CEO of Pepsi had the idea to create a logo on the bottle cap. This started a tradition that lasted for decades. Pepsi-Cola, seeking to show support for the United States and capitalize on patriotic feelings, introduced the iconic red, white and blue colors onto their products. This logo became wildly popular and, to this day, the color scheme is the same. Then, in 1973, Pepsi introduced the “boxed-in” Pepsi logo. 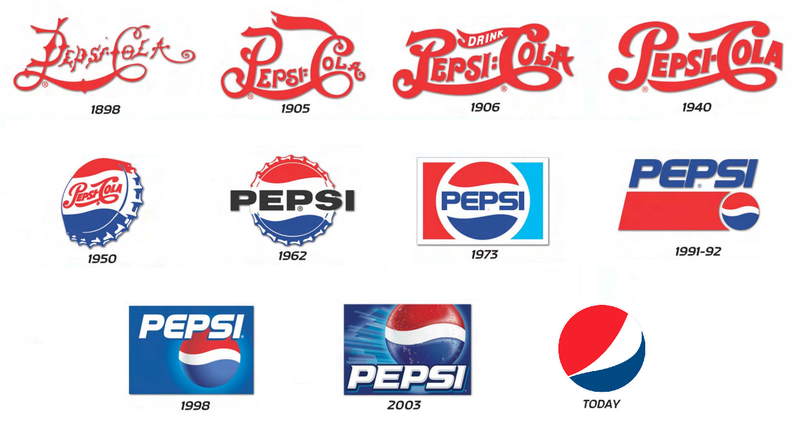 Pepsi then experimented with several different color schemes throughout the 1990’s. The Pepsi Globe, the official term for the round Pepsi logo, started getting greater and greater emphasis within the logos during this time. Then, in 2003, Pepsi did away with their script entirely and focused solely on the globe.